Should I Buy Boring Company Stock? Subject: Should I Buy Boring Company Stock? Elon Musk's latest venture has secured contracts to drill new tunnels under Chicago, so you might be asking, "Should I buy Boring Company stock?" The Gains on This One $10 Stock Alone Could Earn You Enough to Retire: Click here now for details. The Boring Company is one of Elon Musk's signature disruptive companies. It promises to "bore" tunnels for Musk's "Hyperloop" technology. The Hyperloop – once fully developed – will allow people to travel hundreds of miles in mere minutes. For example, a passenger that leaves Washington, D.C., via the Hyperloop should be able to reach New York City in just 30 minutes after traveling at speeds of over 750 miles per hour (mph). This is under a quarter of the time it takes to travel that distance now. Hyperloop's potential speed is much faster than a commuter train and more than double the speed of a maglev train. Maglevs are currently the world's fastest trains and can reach maximum speeds of 268 mph. Last July, Musk announced the Boring Company had approval to start creating a tunnel between New York and Washington, D.C. Since then, the company has begun digging on a Los Angeles project and in areas around Baltimore. 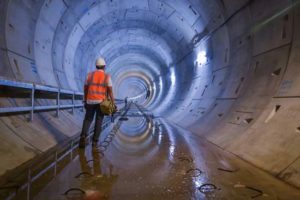 On June 14, Musk announced the Boring Company won a major contract to construct an underground, high-speed transit system in Chicago. Even though the city hasn't released the bid, the value of this project has been estimated at just under $1 billion, according to the Chicago Tribune. In exchange for paying to build the project, the Boring Company gets to keep the revenue that it generates from transit fees, branding, in-vehicle sales, and advertisements. The revenue potential is enormous, but Musk's company must first deliver on its promise to produce this system at the agreed price. Underground transportation systems are also notoriously costly. The Second Avenue New York City subway line cost roughly $2.5 billion per mile. The Paris Line 14 Extension ran about $450 million per mile. Musk is claiming that his team can deliver this project at less than $60 million per mile of tunneling, and this does not include the cost of vehicles or stations. Investors may be excited about the prospects for this company, but don't look for a Boring stock symbol anytime soon. Even though there have been major projects announced and even started, this technology is still unproven. There still isn't a functional Hyperloop design, which means the potential breakthrough and high-speed travel is still just theoretical. There have been several rounds of competitions to put together the best Hyperloop prototypes, with another happening this year. Unfortunately, no competitor has yet reached the targeted 750 mph, which is necessary for Hyperloop to work. There are also some regulatory roadblocks with many of these major projects. Getting a verbal commitment to build a Hyperloop between New York and Washington, D.C., is important. But dealing with all of the necessary state and local permits to complete the Hyperloop is a separate challenge. Plus, you may not see a Boring ticker for a while because Musk prefers that his companies are commercially viable before he takes them public. He has said this about SpaceX, and there is no reason to think that the Boring Company will be any different.